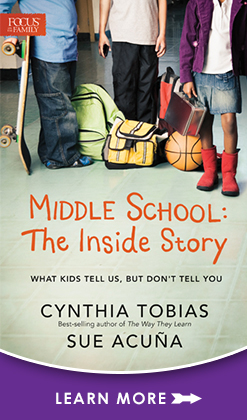 Cynthia’s latest book, “Middle School: The Inside Story” is now available for purchase. Click here to order now. Learn more about the book below, and watch the video. Best-selling learning-styles expert Cynthia Tobias and veteran teacher Sue Acuña reveal what they’ve found by listening to kids when parents aren’t around – and give you insider tips on how to bless your middle-schooler with success in class, at home, and in relationships. Topics include advice for keeping communication lines open, predictable physical and social issues, and solutions for problems like self-centeredness and over-the-top emotions. Click here to order “Middle School: The Inside Story” now.